Let’s call “Deposits” all zero-day claims held by the non-financial sector on the financial sector. When the financial sector expands its balance sheet by granting a loan, transactionally, the creation of the loan creates an additional deposit. But the the owners of the additional deposit are not required to keep the deposit, they can purchase bonds. If the bond is another non-financial bond, then there is still an excess deposit, so another bond is purchased, etc. The release mechanism for this process is that, on the margin, the non-financial sector (slightly) bids down the price of bonds relative to deposits and the financial sector supplies an additional bond, satisfing the excess demand for bonds and reducing the excess supply of deposits. The role of the financial sector is to bridge the gap between the types of assets that the non-financial sector wishes to hold and the types of liabilities that the non-financial sector wants to incur. Although, transactionally, loans create deposits — in equilibrium, the loan can result in the creation of a bond liability rather than a deposit liability. 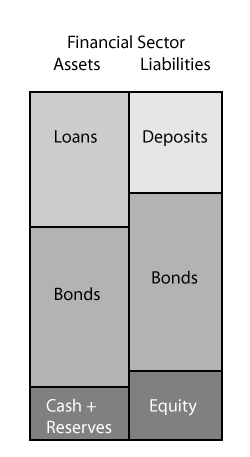 Therefore for a given level of savings and interest rates, the non-financial sector holds the proportion of bonds and deposits it desires at all times, and quantities generally adjust more quickly than rates, because the sensitivity of savings demands to interest rates is substantially less than the sensitivity of bond supply to interest rates. Finance is a buffer between bond suppliers and bond consumers, adjusting its own net bond position to bridge the gap between supply and demand, so that households always hold the proportion of bonds to deposits that they demand. Suppose the central bank intervenes in an attempt to adjust the portfolio holdings households by purchasing a treasury. 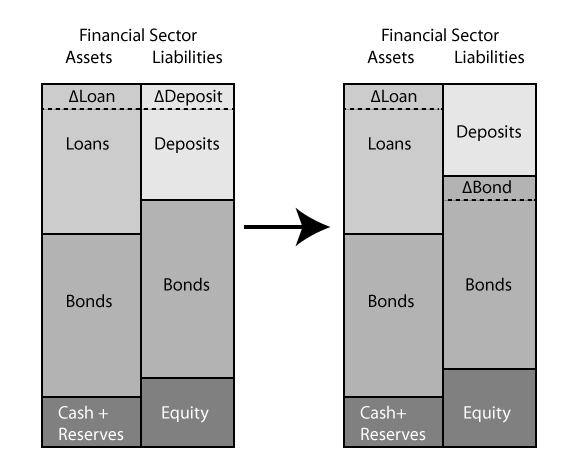 By offering an attractive bid, the CB is able to purchase the bond, but as the non-financial sector was already holding its desired proportion of bonds to deposits, households will demand the same premium from the central bank as the premium that the financial sector demands for supplying them with an additional bond. The swing supplier will set the premium, and that premium will (generally) be small if the elasticity assumptions hold. In that case, the household sector has an additional deposit claim on the banks, which is backed by an increase in cash, and after it purchases the financial sector bond, the household sector restores its portfolio allocation to the desired level. The financial sector ends up with more cash and less (net) bonds. It is as if the central bank is conducting a portfolio swap with the financial sector. The central bank is pushing on a string, by neither increasing the quantity of deposits nor decreasing the quantity of bonds held by the non-financial sector. But there is nothing special about the central bank — the same is true if the foreign sector, or the government sector, or any sector buys and sells bonds. They are all simultaneously engaging in portfolio swaps with the financial sector, whose balance sheet adjusts to bridge the gap between assets demanded and assets supplied. Households may desire more savings, but Central Bank portfolio swaps cannot supply them with more savings. All that the asset swaps do is supply the private sector as a whole with a different allocation of savings, but asset swaps fail to force the non-financial sector to hold a different allocation of savings. The government can neither supply the non-financial sector with (materially) more deposits, nor can it supply this sector with more bonds by means of open market operations. As long as the interest-elasticity of the supply of bonds exceeds the interest-elasticity of household savings demands, all CB OMO operations are asset swaps with the financial sector. Government’s monetary policy influence begins and ends with interest rate management, not quantity management. The above argument relies on the financial sector’s net bond position to adjust in such a way as to allow household bond holdings to be determined independent of outside intervention. We are not arguing that household bond and deposit allocations are constant across time, but that holding the overall savings levels, preferences, and interest rates fixed, the allocations will not change as a result of intervention from other sectors. We should be able to find evidence of this in the flow Flow of Funds. Define “bonds” as foreign and domestic corporates, munis, treasuries and savings bonds, and agencies. 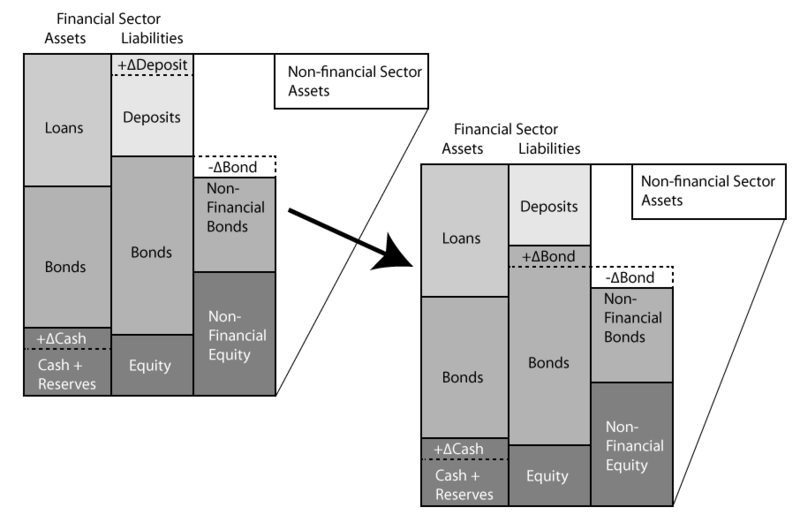 Of the above sectors, households have traditionally been net bond consumers both directly (holdings of sector #1), and indirectly (holdings of sector #2). The Monetary Authority as well as the rest of the world has also been a net bond consumer. Non-financial business is a net bond supplier, but by far the largest net bond supplier is government. The sum of all sectors is zero, and the financial sector sits between the bond suppliers and bond consumers, adjusting its net bond holdings to satisfy the bond demands of household in the face of (extremely) variably bond supply. 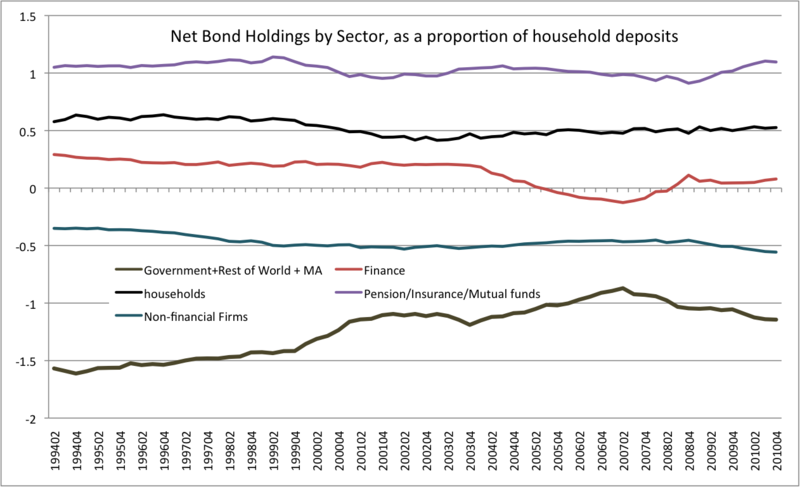 The following is a graph of net bond holdings by each sector as a proportion of household deposits (as we are concerned with tracking the proportion of assets held as bonds versus deposits). In the period from 1952-1974, the bond supply from government rapidly declined, the bond supply of non-financial firms was relatively constant, and the financial sector decreased its net bond holdings, smoothing the household sector’s bond allocation. This was a time of rising inflation as well as demographic and income shifts, so that household bond allocations did decrease, but not nearly by the same amount as the change in bond supply. The financial sector bridged the gap. Focusing on the relatively stable recent period, household bond allocations have been relatively constant even though bond supply changed substantially, with large accumulation by the rest of the world as well as the Clinton surpluses. But if CB purchases of bonds do not alter household direct and indirect bond holdings, then they cannot cause household deposit holdings to increase, as asset swaps do not cause overall household assets to increase. This can also be seen from the data. The financial sector sector severs the connection between the quantity of high powered money and the quantity of deposits, leaving only interest rate management as the tool to alter the non-financial portfolio allocations. Update: Source data is available here (.xslx file). I just responded on my blog post to your earlier comment there. In short, we reach the exact same conclusion in our two posts. We are describing two different mechanisms by which the private sector can adjust to QE such that the broad money supply isn’t impacted. Both dynamics could be occurring, right? 1. Why isn’t what you describe more evident in the H.8 data? Looking at the H.8 data for all commercial banks, the ratio of “deposits” to “borrowings” (other types of bank borrowing) has been *increasing* (from about 3.0 in mid 2008 to about 4.5 recently). If the dynamic you describe is the ONLY adjustment mechanism, then wouldn’t $2 trillion in QE cause a noticeable decrease in this ratio, i.e., deposits falling relative to “borrowings” (bonds, etc)? Deposits are around $8 trillion total and other borrowings under $2 trillion total, so QE should be big enough to move these numbers. Borrowings other than deposits has actually been falling in nominal terms. Are these the right numbers to look at, or are they simply being overwhelmed by the unwinding of Fed alphabet soup programs? 2. What would be the effect of the dynamic you describe on the interest rate banks charge on loans to borrowers? If banks are willing to accept more long term funding via bonds relative to their short term funding via deposits, then their cost of capital becomes higher, right? And to make it even worse, if QE is leaving them with reserves paying 25 basis points as a result of those added liabilities post-QE, won’t that put even more pressure on their cost structure by diluting their asset mix via added reserves, leaving loans as a smaller percentage of their assets? It seems by this logic that QE should force UP borrowing costs within the private sector, exactly the opposite of what the Fed originally said QE should do. But has it? Thanks for your comments and your thought provoking post. Even though the CB was purchasing bonds, if you consolidate the CB + Foreign Sector + Government Sector, they were, in aggregate issuing more bonds (or adding to bond supply). The household sector kept its direct holdings of bonds unchanged, and indirect holdings via pension funds/insurance increased somewhat. Financial net bond position was roughly unchanged. Deposits were also unchanged. So as the CB was buying bonds, the consolidated government sector was selling bonds more quickly, and the household sector just did a portfolio shift, selling bonds to the CB, and then purchasing bonds from government leaving their total bond/deposit mix unchanged. In terms of why you see net borrowings decreasing, that can be due to any number of reasons. First, commercial banking ignores the rest of the financial sector, and in particular Asset Backed Security issuers that are often captives of commercial banks even though they are technically not on their balance sheet. Also, I include money market mutual funds in this sector because MMF holdings are classified as deposits rather than securities in Z.1 and are part of MZM. If banks make less use of wholesale funding markets and more use of deposits, it would appear as though net borrowing to deposit ratio is decreasing, even though as far as the non-financial sector is concerned there is no change. Once you add MMF holdings and consolidate the financial sector as well as group the instruments, then these effects disappear. In terms of whether this is the *only* adjustment mechanism, remember that it boils down the interest-elasticity of supply of bonds versus the interest-elasticity-of demand. Holding demand due to other factors (e.g. demographics, income, preferences) fixed, demand will be a function of rates. But if, as is reasonable to assume, demand is less sensitive to changes in rates than supply of bonds, then this will be the adjustment mechanism. But in the real world, both rates and quantity supplied to the non-financial sector will adjust. It is just that the interest rate effects are quite small in proportion to the quantity effects. One can imagine that if the CB started buying up all the bonds, then at some point, the interest-elasticity of supply will fall below the interest-elasticity of demand. Thanks for the response. It mostly makes sense, but there are a few aspects that I still need to mull over. The graph of bonds held as assets, though valuable for its intended purpose, doesn’t show any information on whose liabilities the bonds are. I imagine that if as you suggest the adjustment from money liabilities to bond liabilities could be occurring in the non-bank financial sector instead of the bank sector, then that should be visible somewhere in the Z.1 data. And it still seems like this adjustment mechanism, wherever it occurs, would put upward pressure on cost structures of the financial entities that perform this adjustment on behalf of the economy, and that this would lead to higher borrowing costs. (Am I wrong on this? Are loans priced independently of the duration of current liabilities?) Though as you say, the interest rate effects could impact aggregate demand and cause other adjustments instead. I’m also curious if you care to comment on whether what you have written in this post is to be found in textbooks (either macroeconomics or finance) or whether it’s your own thinking. It doesn’t matter whose liabilities the bonds are, or at least, I don’t see why it would matter. In terms of effects on cost structure, yes the interest income of the financial sector is reduced when the CB does QE. In effect it would be reducing what I would call the seignorage income of the banking sector. Federal debt sales do not reduce the level of household deposits, they reduce the level of interest bearing assets held by banks, replacing them with excess reserves that do not pay interest. You are increasing the proportion of hard money backing inside money. On the one hand, bank capital goes up (as excess reserves), but on the other hand, interest income declines. But that does not mean that bank cost structure must increase. Banks have reduced interest income, but their marginal costs of extending a loan would only increase by a small amount, due to leverage. I.e. Suppose banks have interest bearing assets of $2000 (say zero reserves), Deposit liabilities of $800 paying 1%, equity of $200 paying 8% and $1000 of bonds paying 5%. Say that bank cost of equity is 8%, and bonds pay 5%. Now the CB buys $50 of bonds from the household sector, and at the end of our process, banks have $1050 in bond liabilities. Interest bearing assets are unchanged, but bank capital has gone up by $100, of which $100 is reserves and $800 is equity. After the operation, the weighted average cost of capital is 3.7317%. In order to maintain the same level of profitability, banks would need to earn 3 more basis points on their assets, or the bond yield would need to decline by 6 basis points. Some combination of these two would happen if bank profits are constant. In reality, there are large economic rents being earned that can be cut into prior to the cost of capital increasing. This was assuming a QE that was 25% of the amount of bank equity. Currently financial sector equity is about 2 Trillion, so that would be close to the 500 Billion in QE that was performed. With a 1 Trillion QE, or a QE equal to 50% of equity, these numbers shift (in our example) to an increase in rates on assets of 6 basis points, or a decrease in bond yields of 12 basis points. Again, this all a battle of elasticities — interest elasticity of bond supply versus interest elasticity of borrowing and of savings. In terms of textbooks, well, it is orthodox to view the financial sector as bridging the gap between the assets that savers want to hold and the liabilities that lenders want to issue, and they do this by transforming the maturity of the assets. All I’m doing is applying this analysis to interventions, arguing that if the CB tries to transform the maturity of assets away from what households want, then the banks can undo this operation by making a transformation in the reverse direction. You will get a slight adjustment in yields but households will continue to hold the types of assets that they want, assuming the interest-elasticity of savings is much less than the interest elasticity of bond supply. I decided to apply your approach to the Fed’s actual QE quantities. Assume $2 trillion of QE has occurred since late 2008, and for the sake of simplicity it was the non-financial private sector that parted with all the securities acquired by the CB. The Fed’s H.8 shows about $12,000bn for total banking system balance sheet size. Of that, roughly $8,000bn is deposits, roughly $2,000bn equity, and roughly $2,000bn is other liabilities including bonds. After QE, and assuming the financial sector enables in full the adjustments you describe, the new liability numbers would be $14,000bn total balance sheet size, $8,000bn in deposits, $2,000bn in equity, $4,000bn in other liabilities including bonds. That’s only a 31 basis point increase, so as a result of your explanation I now agree that this cost could likely be absorbed without necessitating much or any increase in private sector borrowing costs. It doesn’t matter for the purpose of your graphs, which was to show evidence that households and businesses are able to keep a relatively stable proportion of bonds in their portfolios relative to deposits. But I still believe it does matter if we want to look for concrete evidence that the mechanism you describe is what actually occurs to deliver this macro outcome. In the overall financial sector, according to the example above, there must be $2,000bn less in money liabilities (deposits + money markets) and $2,0000bn more in bond liabilities (or similar). (Assuming for simplicity no other changes in the economy). I wasn’t seeing that shift in the banking system H.8 data, but you suggested the liability evidence might show up elsewhere in the financial system. The logic makes sense to me. And until someone convinces me otherwise, I still believe the dynamic I summarized in my posts (a compositional shift within private sector debt from bank loans to non-bank debt) is at least as important of an adjustment mechanism, perhaps happening in parallel. The graphs I created from both Japan and the US historical data seem to me to show strong real world evidence of this. I incorrectly said above “…according to the example above, there must be $2,000bn less in money liabilities (deposits + money markets) and $2,0000bn more in bond liabilities (or similar)…” I was being sloppy. The former would NOT occur directly when comparing pre-QE to post-QE, i.e., the change would be visible mostly via the latter effect. (I was more clear on this in my first comment that attempted to look at the ratio of the two in the H.8 data). I posted a new blog to respond to these issues. Btw, I tried to post a response on your blog, but my WordPress OpenID was rejected by Blogger. I had similar problems trying to comment on Winterspeak’s site. Sorry it didn’t work for you! My settings are pretty much the default. You could comment anonymously and sign at the bottom if you still have your comment text and haven’t covered the same details elsewhere. hbl, it is important to keep in mind that bank balance sheets are constantly being rolled over. Typically a 5 year tenor is used as the benchmark for duration of the bank balance sheet. So over 2-2.5 years since QE1 one could say that half of the 12 trln banking system balance sheet has been rolled over. This is roughly 3 times the volume of both QEs. So it can be perfectly fine that the shift you are talking about IS occurring. However you do not see in the data because the banking system can absorb much higher volume of adjustments in the given time frame. RSJ, I would disagree already with your starting position. We need to be careful and have a clear understanding of the difference between loans and bonds. You can not say that a loan can result in the creation of a bond liability. Every bond liability is offset by a corresponding bond asset and the creation of both of them is accompanied by the exchange of *pre-existing* deposit. By deposits I mean only zero-maturity deposits as any term deposit can be functionally treated as bond. So bonds do not and can not create deposits, they just swap existing deposits. There are two topics which we touch here. One is the composition of the financial portfolio held by the private sector and by its subsectors. Another is the effect of QE on the aggregated financial portfolio of the private sector *and* its subsectors. But first of all, out of all sectors in the economy we need to be careful about the banking sector and the government. The reason for this is that both of them *explicitly* affect with maturity transformation in the rest of the economy. However, they work on the opposite sides: the banking sector provides zero-maturity assets (demand deposits) in return for long liabilities (loans) while the government provides long assets (bonds) in return for zero-maturity deposits. In this sense the banking sector “sells” maturity transformation (adds transactional liquidity) and the government buys it (purchases transactional liquidity). If you freeze the operations of these two, then no other party in the economy is able to influence the volume of maturity transformation in the economy, non-banking financial sector including, because no other party in the economy is able to *create* zero-maturity deposits. Whatever the rest of the economy does it simply reshuffles the existing maturity transformation driven by its desire to squeeze a bit more efficiency. This process can be described by the standard monetaristic velocity. The banking sector and the government in aggregate respond to the financial portfolio mix desires of the non-banking private sector. This mix *IS* the volume of maturity transformation that the non-banking private sector in aggregate wants to hold. What non-banking *financial* sector does is just to optimize the distribution of existing maturity transformation within non-financial private sector. Every optimization has its costs and these costs are reflected by the prices that the non-financial private sector (e.g. households and we can stop drilling down here) will have to pay for the portfolio mix (maturity transformation) they desire. And this is where your conclusions is wrong: it is rather rates (prices) which adjust than quantities because if we exclude the banking sector and the government then no quantities are able to satisfy any abstract desires of non-financial sector with regards to maturity transformation. Now let’s turn to QE and its effects. When the central bank is forcing a QE onto the private sector, it is withdrawing existing maturity transformation. In response to this, the remaining maturity transformation has to reallocate within the non-banking private sector driving changes to the prices of all financial assets held by the non-banking private sector. In the end these prices adjust to such a level as to make all subsectors of non-banking private sector (e.g. non-banking financial and households) indifferent with regards to their reallocation desires. As a by-product of this, QE significantly increases the volume of zero-maturity assets held by the non-banking private sector. However zero-maturity assets are the transactional liquidity in monetaristic sense. Now, if we turn back to bank lending then the driver behind demand for loans is the desire to get transactional liquidity. So what QE effectively does in terms of transactional liquidity is that it replaces demand for bank lending, i.e. absolutely the opposite of the intended goals. And as transactional liquidity becomes abundant, the increasingly strong competing desires of the non-banking private sector for diminishing maturity transformation drive the lending/borrowing activity outside of the banking system. I believe that this is the argument that hbl has. There is however another aspect to the bank lending story which I tried to explain in the comments to the post of hbl on this blog. If the non-banking sector feels unhappy about its transactional liquidity and its holdings of zero-maturity assets then it can reduce it by paying back bank loans and therefore reversing “loans create deposits”. And that is probably why we still can see the contraction of bank lending. We have data on this. The non-bank private sector’s deposit and bond holdings are _unchanged_ as a result of QE, and you need to explain why. The financial sector is the one that ends up with excess reserves (more short maturity assets) and a lower net bond position (fewer longer maturity assets) as a result of QE. Go take a gander at the FoF. Whether the transactional act of granting a loan creates a deposit or bond is irrelevant. One transaction sets off a chain of many other transactions, and what is important is the new equilibrium into which the system settles. What you say does not contradict what I say. Non-banking private sector is the whole private except banks which includes non-banking financial sector and non-financial sector (household or corporate). However I put these two sectors into the same bucket with regards to their ability to influence aggregated maturity transformation. Whether it is financial non-banking sector or household sector or corporate who ends up with excess deposits is irrelevant for my argument. They both operate within exogenously given volume of maturity transformation and their portfolio allocations simply affect the prices and *not* the volume. Whether the transactional act of granting a loan creates a deposit or bond is absolutely critical because such transaction will or will not create zero maturity asset without which any maturity transformaiton and portfolio re-allocation of savings desires is impossible. There is simply no extra quantity to reallocate. No, this is the difference between a partial equilibrium analysis and a general equilibrium analysis. There is no such thing as an isolated transaction, there is a chain of offsetting transactions. A Household takes out a loan to buy a a new house, the homebuilder receives a deposit, and uses it to pay his creditors and workers, who turn around and purchase a bond with the some of the proceeds of their income. The bank, at the same time securitizes the loan and sells a bond. Transactionally, the loan created a deposit. In equilibrium, the loan was offset by a bond, with household deposit holdings unchanged. As to your elasticity argument — think carefully about what you are saying. A change in price also results in a change in quantity. The argument that I am making about elasticities is that the financial sector is much more sensitive to spreads than the non-financial sector, because it uses leverage. So a small change in price will reduce household demand for bonds, but not by much. However, it will incentivize the financial sector to sell more bonds by a greater amount. The interest-elasticty of bond supply by the financial sector is greater than the interest elasticity of bond-demand by the household sector. Therefore while it’s true that at the equilibrium, households are happy with their allocations, the issue is whether quantities or yields make the largest adjustment. My argument is that quantities make the largest adjustment. When non-financial bond supply decreases but non-financial bond demand does not decrease, then it is primarily quantities that adjust, and these quantities are supplied by the financial sector. 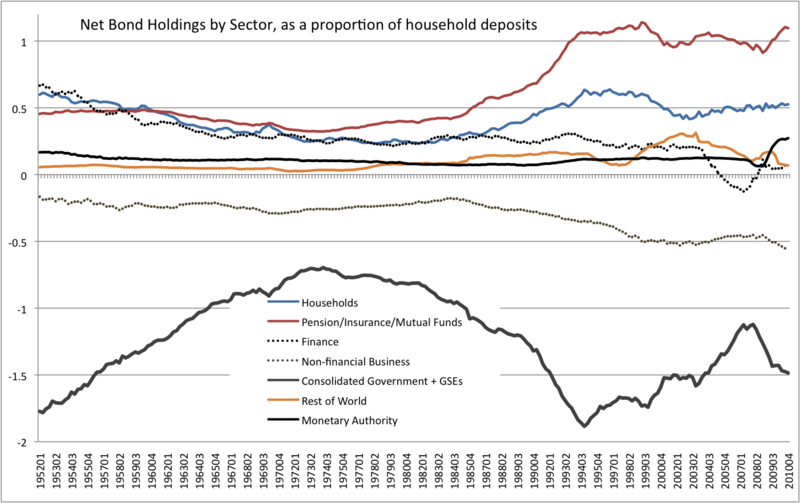 Again, go take a look at Z.1 to see whether QE had any affect on household bond holdings or deposit holdings. Or pension funds. Or insurance. Zero effect of QE on any of these sectors’ bond or deposit holdings. Households were not deprived of bonds even though they sold bonds to the CB. Similarly, when the foreign sector (e.g. China) was accumulating large amounts of U.S. bonds, neither households nor insurance/pension funds were deprived of bonds. They replaced the bonds they sold to China to with financial sector bonds they purchased from banks. That’s a famous (or perhaps infamous) example of the financial sector stepping in to supply the non-financial sector with the types of assets that they want to hold. I still do not see how it contradicts what I say. Yes, households are less sensitive to prices changes and it is fair to argue that in general they try to stick to their old habbits. But again, this is not the point of the discussion. The whole discussion started as an argument about QE effects on bank lending. The argument of hbl was that bank lending is being substituted with capital markets _swaps_ (deposits for bonds). Then I tried to say the private non-banking sector tries to rid of QE-induced zero-maturity assets by running down its loan portfolio. Zero-maturity assets play a special transactional role and with abundance of it coming from QE (and they do come, you can not deny it) there is much less need, if any on the net basis, for demand deposits coming from new bank lending. So while hbl was focused on the differences between banking and non-banking financial sectors, I am not interested in it at all. This difference is not important for my argument. It also has nothing to do with the chain of transactions initiated by a bond sale. Or rather it is again irrelevant for QE effects. Once you recognize that deposits do not leave the banking system you will see that there is no chain to talk of. The purpose of my blog is a bit different from HBL. Yes deposits never leave the banking system but that is irrelevant since we are measuring net deposits, not gross deposits. When a household purchase a non-deposit liability of the financial sector as a whole, then its deposit is reduced as is the deposit level of the household sector. And this is what we are interested in. Deposit and bond claims of the non-financial sector. We ignore the claims of one financial institution on another, since those are tucked into interbank liabilities — excess reserves — and they aren’t going to affect the money supply or the portfolio allocation of households and pension funds. The argument is that regardless of who the CB is transacting with, whenever it tries to move households away from their desired allocation of deposits and bonds, the CB is “effectively” performing an asset swap with the financial sector, and it will not change the actual deposit levels of households. This is an important result, and it rests on the relative elasticities of households and the financial sector. It’s an elasticity argument, and to counter it, you need to explain why you think the elasticities will be different. You are not going to counter this argument with an “operational” description. At least, I hope you see this point, regardless of whether you agree with me or not. Actually, to make a correction, whether or not deposits “leave” is a question of the scope of the balance sheet. If I bank with B of A, and I purchase a B of A bond, then I exchange my deposit claim on B of A for a bond claim on B of A. Therefore a deposit has left B of A. Now, consolidate all the financial institutions and look at the total deposit claims of the non-financial private sector on the financial sector. Every time they purchase a bond (or equity) sold to them by the financial sector, the deposits of the non-financial sector are reduced. Then apply the elasticity argument — how much of a premium will households need to offer the financial sector before they can purchase a bond from it? This will be the same premium that the CB needs to offer the household sector before it can purchase a bond from it. You don’t have two different premiums, one for the CB, and another for households. The reduction in yield as a result of that premium is not going to materially affect household asset allocation. They will be able to replace the bonds they sell to the rest of the world, to the CB, or anyone else. Now if the CB keeps purchasing bonds, then at some point the rest of the private sector is going to fail to be able to increase bond supply to households. The interest-elasticity of supply will change. In that case, spreads will go up and yields will fall. The market will become less liquid as households will no longer be able to sell a bond and then buy another one for roughly the same amount. But we are far, far from that happening, and it is difficult for a central bank to drive the market to that point. Just to clarify the oft referenced “financial sector bonds” locution. Do ABS represent an exhaustive list of f.s.b ? In other words, are they, ABS and f.s.b, exact synonyms in your exposition ? One would want to agree about terminology. In the blog, I defined “bonds” as munis, treasuries, agencies, and foreign and domestic corporates. In the Flow of Funds coding, look at L.209-L.212. Financial sector (gross) bond liabilities are the corporate bond liabilities in L.212 that are liabilities of those sectors that I’ve defined as the financial sector in the blog. The bond assets are those bonds that are held as assets by the financial sector. What is important is the net bond position = bond assets – bond liabilities. The argument is that the net bond position of the financial sector adjusts to absorb any excess bond demand by the non-financial sector at the cost of changes in yields. But the changes in yields are sufficiently small that the bond demand of households (and other non-leveraged sectors) is mostly unchanged at the new yields. Therefore actual household bond holding are (mostly) unchanged as a result of interventions. But in that case household deposit holdings will also be (mostly) unchanged. Actually, I almost agree with your exposition if one considers ABS only. I am not sure about the other instruments — I need to think. That’s why I broke up the sectors in this way. When the rest of the world, government, or the monetary authority increases their net bond holdings, this does not mean that households must decrease their bond holdings. More bonds can be supplied (on a net basis) by non-financial firms or financial firms. Generally speaking, non-financial firm bond position is not going to swing a whole lot in response to movements in the other sectors. It may, but typically the financial sector is the swing supplier, as this sector is the most sensitive to changes in interest rates. A 50 basis point swing isn’t going to cause firms to go on a bond selling spree, but it will create large incentives for the leveraged financial sector to supply more bonds. You are right in that historically the instrument of choice has been ABS. But there is nothing special about ABS per se. Any increase in net bond supply by the financial sector, or equivalently a decrease in the net bond holdings of this sector, is going to allow the household sector to maintain the level of bonds that they want. As the rest of the world buys bonds, or as the CB buys bonds, or as the government sector reduces its sale of bonds, households and pension funds are not deprived of holding bonds. We’ve seen this very clearly when China went on a bond buying spree. Pension funds did not reduce their bond holdings, and neither did households. The financial sector increased bond supply to allow household direct and indirect bond holdings to remain constant. The yields change just a bit, and the financial sector increases net bond supply. As a result, given that total savings do not change as a result of these asset swaps, household deposit holdings don’t change either. This is consistent with the data that neither QE nor current account deficits have an effect on either increasing household deposit levels, or decreasing household bond levels. And the same holds for pension funds, mutual funds, and insurance. 1. Since the deposit level is unchanged even though $1.1T worth of deposits was generated as a result of QEn, the hypothesis (with which I tend to agree) is that the extra deposits were absorbed by “bank bonds”. Bank bonds are 1. ABS; 2. bank issued bonds. 2. ABS essentially results in converting a bank loan into a contract between non-bank parties (with some complications when the sponsor decides foe whatever reason to salvage a failing SPV) with attendant deposit elimination. In a way, securitization converts loans into commercial bonds. 3. Bank issued bonds eliminate deposits too, but they are subordinated debt due to FDIC priority in the case of bank dissolution etc. 4. The non-bank sector takes on higher risk by converting its T-bonds holdings into ABS/bank issued bonds. Is it a fair summary ? Is there data that would show a breakdown between bank issued bonds and ABS ? One would imagine that ABS ability to absorb extra deposits is somewhat diminished due to lower level of lending and actual/perceived current riskiness of such instruments. Not sure about bank issued bonds. Matter of perception, I’d guess, what with Fitch and Moody illuminati. Actually, this last time as the CB purchased bonds, the government was selling, so households sold a bond to the CB and used the proceeds to buy a bond from Treasury, keeping both their deposit holdings and bond holdings the same. There was no need for the financial sector to supply more bonds, and it did not. 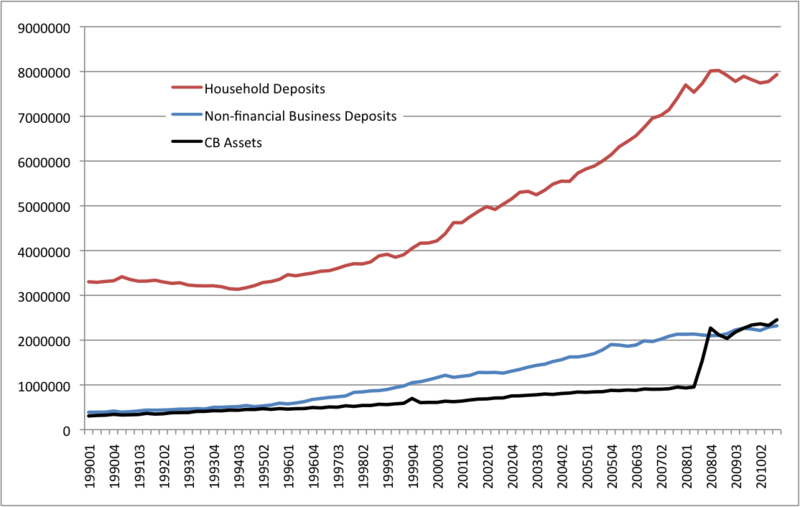 But as the CB pays with cash, the quantity of reserves did increase, even though the quantity of non-financial deposits did not. But that movement is invisible to the non-financial sector. A better example would be when the foreign sector was accumulating treasuries. In that case, households + pension funds rotated into MBS supplied by the financial sector. Finance did increase its net bond supply in response to the increase in bond demand coming from the foreign sector. At the time pension funds and households did not believe that they were taking on excess risk, as they were buying AAA bonds. That’s what I am not quite happy with — it’s too a general description that depicts kind of meaningless shuffling. What specific maturities did the households sell to CB/bought from T ? Surely, it does not make sense to replace higher yielding bonds with lower yielding ones unless the CB overpaying. Is that the assumption, that the CB is outbidding the market ? Assuming such a T-bond swap, new issues for the old ones, is financially neutral, it is a rather meaningless activity on the households’ part, whether direct or indirect, no ? 1. I don’t have data about maturity holdings of households versus other sectors. But for the non-financial sector as a whole, you can look at the maturity that the CB bought and compare to the maturity that Treasury sold. I would be surprised if there was a big change. 2. I wouldn’t call it a shell-game. You have multiple bond suppliers and many bond purchasers. The CB increased its holdings and Treasury + foreign sector reduced their holdings. Household direct and indirect bond holdings increased somewhat, and household deposit levels decreased somewhat. If you want to think of this as Treasury + foreign sector selling bonds to the CB, I have no problem with that assessment, except that they were sold at market prices rather than at policy-set prices. The point is that what determines non-financial deposit levels is the overall level of savings and interest rates. OMO do not increase overall savings and the connection between OMO and interest rates is not a quantity connection per se. Thinking some more. It’s a trivial observation that the deposits *must* grow even though households may choose to buy new issues from T, after selling to the CB/OMO. The deposits must grow due to the T deficit spending, obviously. Not sure why I did not mentioned that the first time. So, you still need some absorption mechanism to consume extra deposits. What mechanism might that be ? Are we back to the idea that the finsec is the deposit neutralizer ? Yes, deficit spending, as it adds to financial savings, will increase non-financial sector bond and deposit holdings. But the savings are not increasing because of portfolio shifts, but because the government is deficit spending. That total effect on savings must be balanced against the other effects –e.g. de-leveraging, which reduces savings, or imports, which also reduce savings. So in our case, even though the government did deficit spend a great deal, total savings did not increase, as the household sector was de-leveraging. And it still seems like this adjustment mechanism, wherever it occurs, would put upward pressure on cost structures of the financial entities that perform this adjustment on behalf of the economy, and that this would lead to higher borrowing costs. On my another re-reading of this and related threads, the adjustment mechanism seems to actually be through lower borrowing costs and not higher. Since QE is removing duration from the economy it will, as rsj writes, cause the financial sector to readjust vis-a-vis the relatively stable portfolio preferences of the non-financial sector. However as it is financial sector which picks up the tab it will re-adjust by “charging” more to put its bonds on sale, i.e. it will sell the required volume of bonds at higher prices. It also means that it will sell bonds at lower yields and this is the cost which matters for borrowing (flow). Not the market price of bonds (volume). If we look at banks vs. non-banks split then banks have higher cost structure due to (at the very least) cost of capital. So for every individual bank there is a (low) certain interest rate where this bank clearly becomes uncompetitive. Economy-wide you can treat this interest rate as the hurdle rate for borrowers to switch between bank and capital markets borrowing. As economy-wide average borrowing cost goes down, more and more borrowers find it “profitable” to turn to capital market financing and bear the associated compliance costs. There will remain market segments which will face extremely high compliance costs regardless of borrowing costs. Previously ABS issuers used to bridge the gap between them. These days these guys are out of favour. What that means is that QE seems to squeeze out small and granular borrowers out of the market. This is an incredibly rich topic.